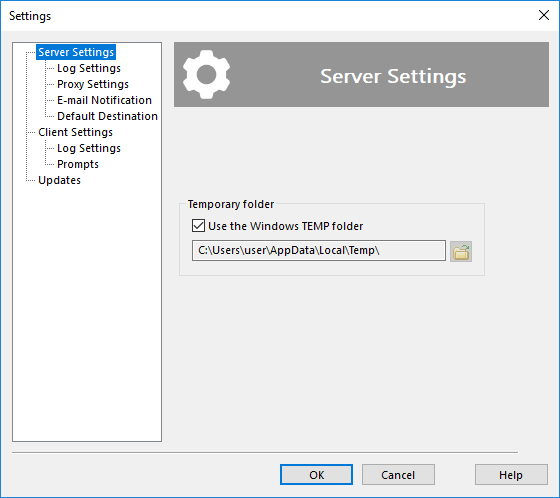 Server Settings contain general settings of the Server component of the software. In the program′s architecture, the term Server is used to refer to a logical component responsible for creating and managing all tasks, scheduling, logging, e-mail notifications, etc. Check Use the Windows TEMP folder if you want the utility to use standard Windows temporary folder. To select a different folder, click the Browse for folder button and browse for another temporary folder. Generally, the program does all processing "on-the-fly", i.e. without creating any temporary files. Temporary folder may be used for new and experimental features that haven′t yet made their way into the program′s core.